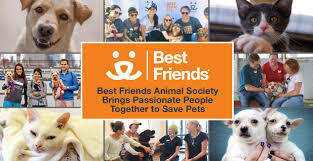 What does kindness have to do with the Best Friends Animal Sanctuary? Let me tell you. In Kanab, Utah, in the heart of Southern Utah’s National Parks, is a haven for over 2,000 abused and abandoned animals. And there you’ll find Angel Canyon, 3700 acres of unlimited love, caring, and yes, kindness. Here’s how it works. Animal lover volunteers from around the country book weeks in advance to choose when to come and what they want to do. There are 8 on-site cottages that book months in advance. Nearby there are plenty of motels and camp sites, all of course which are animal friendly. There are so many opportunities to engage your passion with a variety of animals. You can socialize puppies, walk the dogs, feed and groom the horses, or take a pig for a walk! There’s a cathouse, bunny house or birdhouse for indoor assignments, or you can tend the goats. Each animal has a story, including many rescued puppy mill dogs, and 22 Michael Vick fighting dogs a Judge awarded to Best Friends, saving them from being put down. Many of the animals here are placed and happily many are adopted. This was my second trip to Best Friends, and for two afternoons I chose to work with the senior dogs. In one very large area there were two neurologically impaired sister dogs. They had difficulty walking and even moving their heads. I sat with them, and observed them in a room surrounded by pillows, many comforters, beds and toys. These dogs went to the large therapy pool several times a week, and even had special buggies that helped moved their legs for the staff could take them outside and for walks. Best Friends was giving them the best life they could have, and I got to be a small part of that. So that’s the answer to the question I posed at the beginning. This place gives compassion, love and caring to all these animals. Hmmm, that’s Best Friends, and kindness, and that’s what SedonaKind is all about as well.